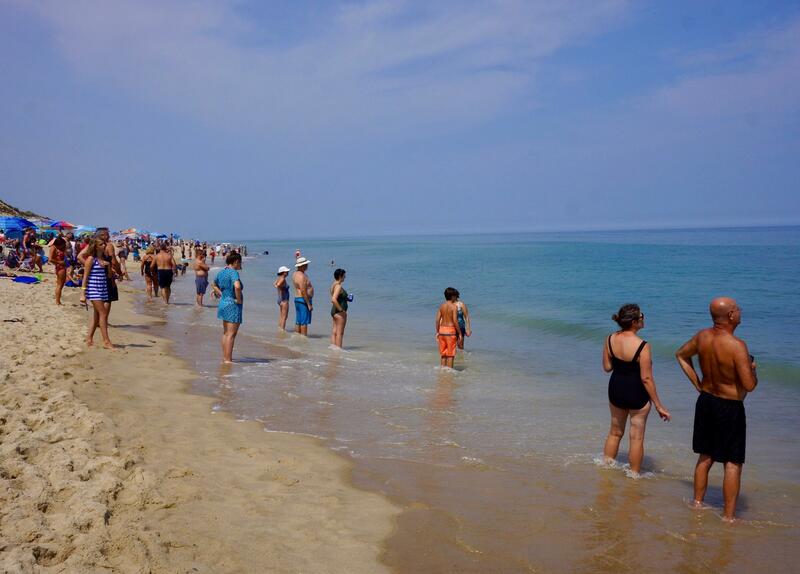 An image from a Wellfleet beach earlier this summer, as beachgoers study the water after a closure for a shark siting. "People brought down towels, wrapped his legs in towels, one of the younger guys cut his boogie board free," Swistak said, describing how people tried to stave off blood loss from his wounds. "His right leg was the most injured leg. Another guy took my dog’s leash put it around his left leg for a tourniquet. Rich Littauer, who was also at the scene, said the wounds the shark inflicted looked bad. "There was a lot of blood, a lot of blood," Littauer said. This is the second shark bite attack in Massachusetts this year, after a 60-year-old man in Truro was bitten in August but survived. This attack is the first shark bite-related death in Massachusetts since 1936, when a teenager was fatally attacked about 50 feet from the shore off Mattapoisett. Additional reporting done by WGBH reporter Bob Seay.